Incoming Deputy Chief Election Officer (DCEO) of the Guyana Elections Commission (GECOM) Roxanne Prince-Myers has dismissed the suggestion that her seemingly partisan Facebook posts make her unsuitable for the sensitive post, while saying that attention should instead be given to her strong track record of professionalism. In an interview with Stabroek News yesterday, Myers noted that she has always publicly commented on good governance and social justice issues. “I have been on a record speaking out about governance issues in this country, speaking out about VAT on education in this country, speaking out about removing columnists from the [Guyana] Chronicle, those are on my public profile,” Myers said, while adding that when the media is reporting on what the opposition is saying about her, it should seek to maintain a balance. “I am saying that the judgement of my professional career, that should be the test for me, that should be the standard bearer, my professional career,” she stressed, while also noting that calling her a PNCR supporter suits the political narrative but does not match with her professional life. Myers yesterday also denied that she deactivated her Facebook page after her posts were made public by the opposition PPP/C. She pointed out that her Twitter account is still activated. She, however, explained that her Facebook page was deactivated because she does not have the time to remove photographs of her family and friends, who she does not want to expose to the criticisms that she is now being faced with. Opposition Leader Bharrat Jagdeo last week publicly criticised Myers for her views, saying they should bar her from holding the position. “I hope that the Chair-man [of GECOM] looks at this because it can undermine the perceived impartiality of the Commission itself,” Jagdeo said as he held up screengrabs last week from Myers’ now deactivated Facebook profile. “These are striking political views expressed by the individual, who has now just been made the DCEO. If there is one thing that should lead to a reversal of this decision, it is this, because it is GECOM. The rest of the government is fine, people can have open political views there in some of these places, except the constitutional agencies,” he added. The three PPP/C-nominated Commissioners walked out of a statutory GECOM meeting last week Tuesday after the Chairman, Justice (ret’d) James Patterson voted to break a deadlock on the selection of the new DCEO by voting in favour of Myers as opposed to former acting DCEO Persaud. Persaud, who was forced to reapply for the job after his previous contract expired while the Commission was awaiting the appointment of the Chairman, was said to have been the highest ranking candidate for the post, while Myers was the second highest ranking candidate. While not having Persaud’s institutional memory, Myers told this newspaper that the test will be how well she performs in the job. 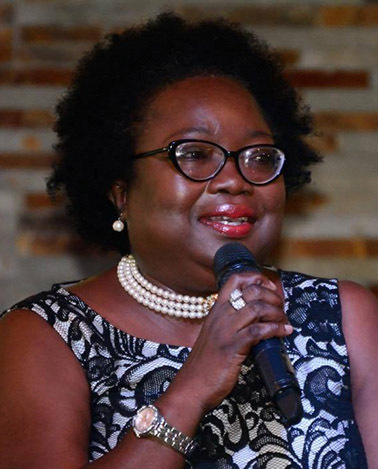 On the suggestion that only persons who do not have stated political sympathies can work at GECOM, Myers said she is unware that this ever happened even though some have laid claim to this by stating that they do not vote. “We all have political dealings,” she, however, asserted. “What I would like to contend, though, in this matter, is the depth of my professional career has shown that I am a professional and I have worked with the PPP while they were in government through numerous consultancies,” she added. She revealed that while she was a child protection officer at UNICEF, direct support was given to the then Ministry of Human Services and Social Security and she had direct interaction with then minister Bibi Shadick, who is now one of the PPP/C-nominated GECOM commissioners opposing her employment. Myers also revealed that in 2005, UNICEF was one of the main supporters of flood relief in Guyana and she was the focal point for coordination for this initiative and again worked directly with Shadick as well as the then Minister of Health Dr. Leslie Ramsammy. “So when people want to talk about bias and professionalism, I make a very close distinction about how I carry out my professional life… and I hope that one day Guyana can reach that level where we can have different political views but when it comes to a job we can work together and get the job done,” she said. She pointed out that no one has asked what Persaud’s political views are and it should be a fair question if it is one that is being asked of her. “But I have a very open profile, maybe Mr. Persaud doesn’t have one,” she noted. Myers also said that while at UNICEF she had direct interaction with Gail Teixeira, who was then Minister of Culture, Youth and Sport. In 2006, she was employed at UNDP and she was part of a team that organised local political leaders’ talks because of a number of things happening in the country at the time and this resulted in a seminal piece of work on peace building in Guyana. While at the same organization, Myers said she implemented a civil society programme to deal with peace, social cohesion and political stability in Guyana and mainly working in the communities that had fallouts. Those communities included Buxton, Annandale, Lusignan and Agricola. “Those are things that are up for the record and the people who are holding to say that I have these political views are fully aware of these facts. I [had] them on my resume when I was interviewed for the job…,” Myers said, before adding that she also had direct interactions with now PPP/C parliamentarian Priya Manickchand when she was a minister as part of work on a domestic violence project. Myers stressed that she has worked “consistently for Guyana” and noted that she had done a study on the elderly in Guyana and had direct interaction with the then Human Services Minister Jennifer Webster. Myers said she was also a dialogue/moderator/facilitator for the Low Carbon Development Strategy in September, 2009, under the Jagdeo presidency. “So, I am not a stranger for the PPP,” she commented. Myers said the question should be whether the then government found her to be biased in any of the reports she was involved in compiling and whether those claims would have been factual. She admitted that the PPP/C government did have a falling out with her when she and other civil society members authored a civil society report on the status of women in Guyana in 2011. “Again, I am saying my work has been consistent for the betterment of Guyana…” Myers said. She also noted that she had worked for the APNU+AFC coalition government under the Ministry of the Presidency and she resigned from that position. Meanwhile, Myers said she was unware that she had been given the green light for the job until it was reported in the media. She said it was her friends who alerted her to that fact and it was a photograph from her Facebook page that was used in an online news report on the issue, which prompted her to deactivate the page. “I took the decision since I didn’t have the time to protect my family members and people who are connected to me. Because of the nature of the job, I removed the page. It had nothing to do with my statuses. I think if anybody knows me well enough they would know that I always comment on good governance issues in this country and social justice, irrespective of political party…,” Myers told this newspaper. She maintained that her statuses are there for the record and she would reactivate the page once she has the chance to remove some of the photographs. She pointing out that her Twitter account is still active and she referred to yesterday’s Stabroek News report which made mention of the fact that from her account she did not only attend and tweet about APNU rallies but also did the same for PPP/C rallies. Myers maintained that she has every intention of reactivating her Facebook account since she is not hiding from anyone but she first wanted to take down her personal photographs as she does not want to expose her family members, many of whom were not even aware she applied for the job until the media reported it. “I have entered at my own risk. I can’t take every other person with me, even my friends with me. So that is the principal reason for deactivating my profile. It had nothing to do with my statuses because many times I put a status I think about it and I am not going to say that I did not say people who were standing on the picket line for [parking] meters, that they should be before the courts, I am not going to retract that,” Myers said. In his five short years, Andrew "AJ" Freund endured more trauma than any child should. The body of 5-year-old Andrew "AJ" Freund was found wrapped in plastic in a shallow grave. His parents have been charged with murder. "We have a missing child."